Global climate is changing and this is apparent across a wide range of observations. 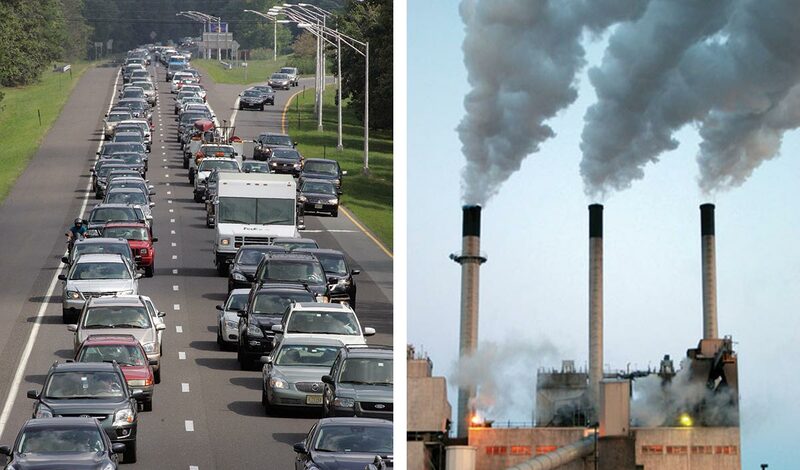 The global warming of the past 50 years is primarily due to human activities. Explore observed climate change and its causes. The key message and supporting text summarizes extensive evidence documented in the climate science literature. Technical Input reports (82) on a wide range of topics were also reviewed; they were received as part of the Federal Register Notice solicitation for public input. Evidence for changes in global climate arises from multiple analyses of data from in-situ, satellite, and other records undertaken by many groups over several decades.1 Changes in the mean state have been accompanied by changes in the frequency and nature of extreme events.2 A substantial body of analysis comparing the observed changes to a broad range of climate simulations consistently points to the necessity of invoking human-caused changes to adequately explain the observed climate system behavior.3,4 The influence of human impacts on the climate system has also been observed in a number of individual climate variables.5,6,7,8,9,10,11 A discussion of the slowdown in temperature increase with associated references (for example, Balmaseda et al. 2013; Easterling and Wehner 200912,13) is included in the chapter. The Climate Science Supplement Appendix provides further discussion of types of emissions or heat-trapping gases and particles, and future projections of human-related emissions. Supplemental Message 4 of the Appendix provides further details on attribution of observed climate changes to human influence. Key remaining uncertainties relate to the precise magnitude and nature of changes at global, and particularly regional, scales, and especially for extreme events and our ability to simulate and attribute such changes using climate models. Innovative new approaches to climate data analysis, continued improvements in climate modeling, and instigation and maintenance of reference quality observation networks such as the U.S. Climate Reference Network (http://www.ncdc.noaa.gov/crn/) all have the potential to reduce uncertainties. There is very high confidence that global climate is changing and this change is apparent across a wide range of observations, given the evidence base and remaining uncertainties. All observational evidence is consistent with a warming climate since the late 1800s. There is very high confidence that the global climate change of the past 50 years is primarily due to human activities, given the evidence base and remaining uncertainties. Recent changes have been consistently attributed in large part to human factors across a very broad range of climate system characteristics. Climate is defined as long-term averages and variations in weather measured over a period of several decades. The Earth’s climate system includes the land surface, atmosphere, oceans, and ice. Many aspects of the global climate are changing rapidly, and the primary drivers of that change are human in origin. Evidence for changes in the climate system abounds, from the top of the atmosphere to the depths of the oceans (Figure 2.1).1 Scientists and engineers from around the world have compiled this evidence using satellites, weather balloons, thermometers at surface stations, and many other types of observing systems that monitor the Earth’s weather and climate. The sum total of this evidence tells an unambiguous story: the planet is warming. Figure 2.2: Global annual average temperature (as measured over both land and oceans) has increased by more than 1.5°F (0.8°C) since 1880 (through 2012). Red bars show temperatures above the long-term average, and blue bars indicate temperatures below the long-term average. The black line shows atmospheric carbon dioxide (CO2) concentration in parts per million (ppm). While there is a clear long-term global warming trend, some years do not show a temperature increase relative to the previous year, and some years show greater changes than others. These year-to-year fluctuations in temperature are due to natural processes, such as the effects of El Niños, La Niñas, and volcanic eruptions. (Figure source: updated from Karl et al. 200918). The majority of the warming at the global scale over the past 50 years can only be explained by the effects of human influences,3,5,4 especially the emissions from burning fossil fuels (coal, oil, and natural gas) and from deforestation. The emissions from human influences that are affecting climate include heat-trapping gases such as carbon dioxide (CO2), methane, and nitrous oxide, and particles such as black carbon (soot), which has a warming influence, and sulfates, which have an overall cooling influence (see Appendix 3: Climate Science Supplement for further discussion).20,21 In addition to human-induced global climate change, local climate can also be affected by other human factors (such as crop irrigation) and natural variability (for example, Ashley et al. 2012; DeAngelis et al. 2010; Degu et al. 2011; Lo and Famiglietti 201322,23,24,25). Figure 2.3: Observed global average changes (black line), model simulations using only changes in natural factors (solar and volcanic) in green, and model simulations with the addition of human-induced emissions (blue). Climate changes since 1950 cannot be explained by natural factors or variability, and can only be explained by human factors. (Figure source: adapted from Huber and Knutti19). The third line of evidence comes from using climate models to simulate the climate of the past century, separating the human and natural factors that influence climate. When the human factors are removed, these models show that solar and volcanic activity would have tended to slightly cool the earth, and other natural variations are too small to explain the amount of warming. Only when the human influences are included do the models reproduce the warming observed over the past 50 years (see Figure 2.3). Oil used for transportation and coal used for electricity genera­tion are the largest contributors to the rise in carbon dioxide that is the primary driver of observed changes in climate over recent decades. 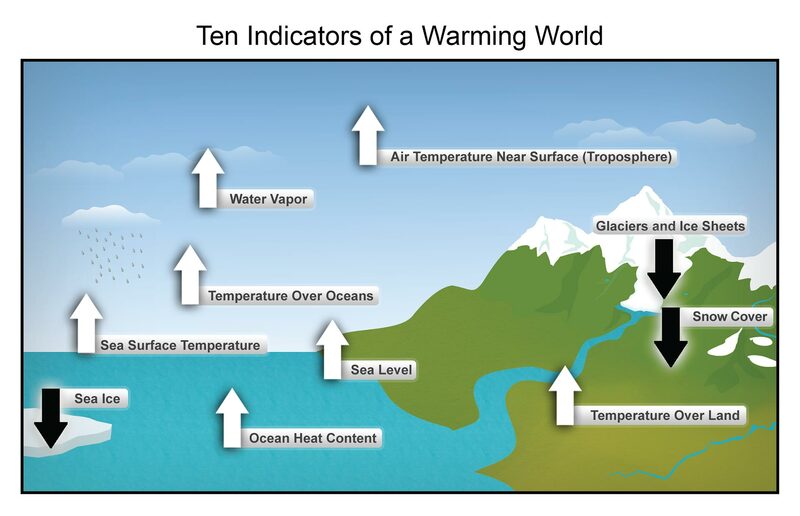 In addition to such temperature analyses, scientific attribution of observed changes to human influence extends to many other aspects of climate, such as changing patterns in precipitation,6,7 increasing humidity,8,9 changes in pressure,10 and increasing ocean heat content.11 Further discussion of how we know the recent changes in climate are caused by human activity is provided in Appendix 3: Climate Science Supplement. Natural variations in climate include the effects of cycles such as El Niño, La Niña and other ocean cycles; the 11-year sunspot cycle and other changes in energy from the sun; and the effects of volcanic eruptions. Globally, natural variations can be as large as human-induced climate change over timescales of up to a few decades. However, changes in climate at the global scale observed over the past 50 years are far larger than can be accounted for by natural variability. Changes in climate at the local to regional scale can be influenced by natural variability for multiple decades.28 This can affect the interpretation of climate trends observed regionally across the U.S. (see Appendix 3: Climate Science Supplement). There are a number of possible contributions to the lower rate of increase over the last 15 years. First, the solar output during the latest 11-year solar cycle has been lower over the past 15 years than the past 60 years. Second, a series of mildly explosive volcanoes, which increased stratospheric particles, likely had more of a cooling effect than previously recognized.35,36,37 Third, the high incidence of La Niña events in the last 15 years has played a role in the observed trends.29,38 Recent analyses13 suggest that more of the increase in heat energy during this period has been transferred to the deep ocean than previously. While this might temporarily slow the rate of increase in surface air temperature, ultimately it will prolong the effects of global warming because the oceans hold heat for longer than the atmosphere does. Coupled Model Intercomparison Project, 3rd phase (CMIP3): global model analyses done for the Fourth Intergovernmental Panel on Climate Change (IPCC) assessment. Spatial resolutions typically vary from 125 to 187 miles (at mid-latitudes); approximately 25 representations of different models (not all are used in all studies). CMIP3 findings are the foundation for most of the impact analyses included in this assessment. Coupled Model Intercomparison Project, 5th phase (CMIP5): newer global model analyses done for the Fifth IPCC assessment generally based on improved formulations of the CMIP3 models. Spatial resolutions typically vary from 62 to 125 miles; about 30 representations of different models (not all are used in all studies); this new information was not available in time to serve as the foundation for the impacts analyses in this assessment, and information from CMIP5 is primarily provided for comparison purposes. North American Regional Climate Change Assessment Program (NARCCAP): six regional climate model analyses (and limited time-slice analyses from two global models) for the continental U.S. run at about 30-mile horizontal resolution. The analyses were done for past (1971-2000) and projected (2041-2070) time periods. Coarser resolution results from four of the CMIP3 models were used as the boundary conditions for the NARCCAP regional climate model studies, with each of the regional models doing analyses with boundary conditions from two of the CMIP3 models. The scenarios for future human-related emissions of the relevant gases and particles used in these models are further discussed in Appendix 5: Scenarios and Models and Appendix 3: Climate Science Supplement. The emissions in these scenarios depend on various assumptions about changes in global population, economic and technological development, and choices in transportation and energy use.